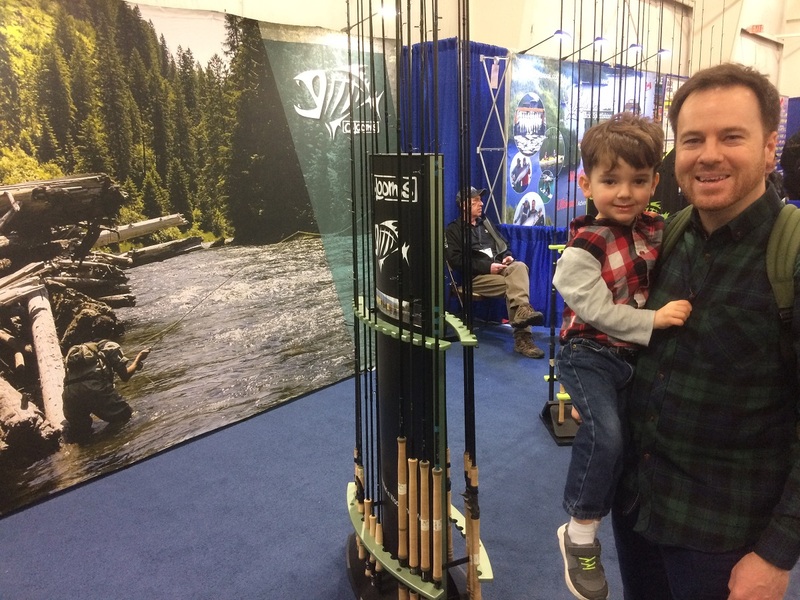 I attended the BC Fishermen’s Show this past weekend with my oldest son Asher. It’s becoming a bit of a tradition for us as it was our 3rd annual trip (actually 3 times in past 4 years, see past journal here). 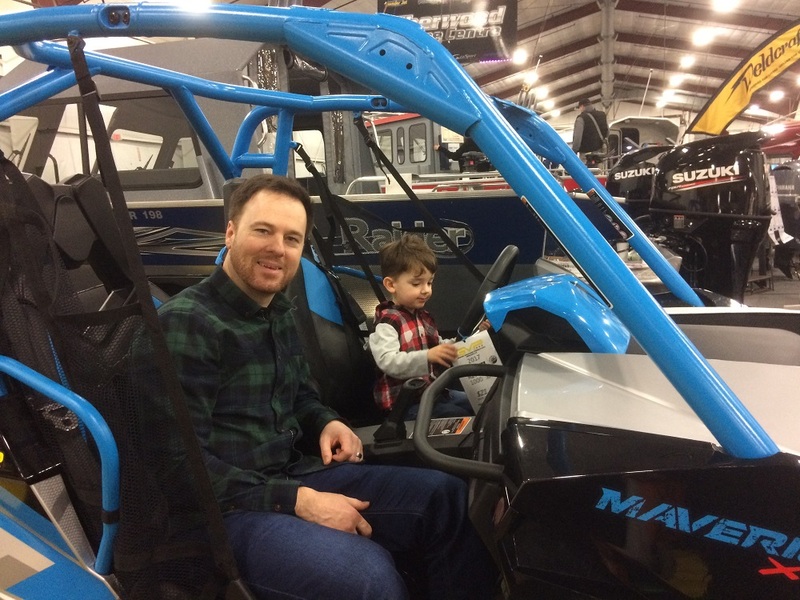 Even with the crowds I really enjoy bringing my son along. 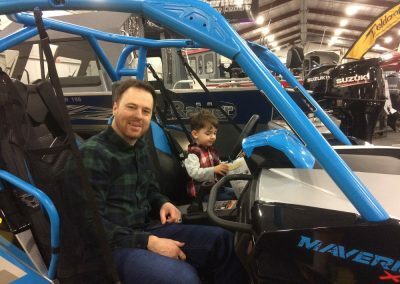 Asher loves sitting in each of the quads and boats. No quad went unseated! 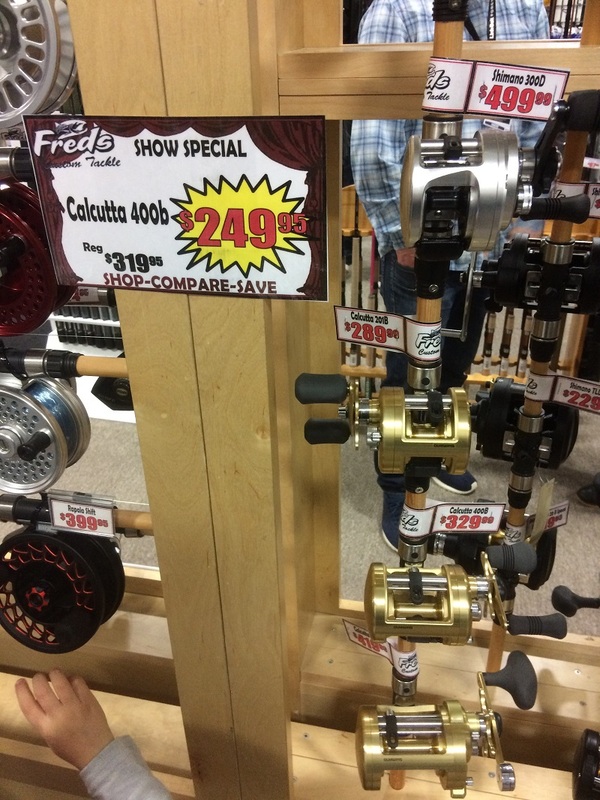 As for me, I enjoy checking out the new tackle that’s coming out and of course the deals! That said, I didn’t spend much money this year as I only picked up a few new trout spinners. My father-in-law found some good deals and picked up a Shimano Clarus 9 ft spinning rod and the new 3500 Shimano Sahara spinning reel. 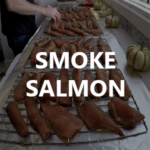 This will be a great spinning combo for Coho & other salmon this Fall on our local rivers. As mentioned, I went through all the retailer booths looking for the best deals. 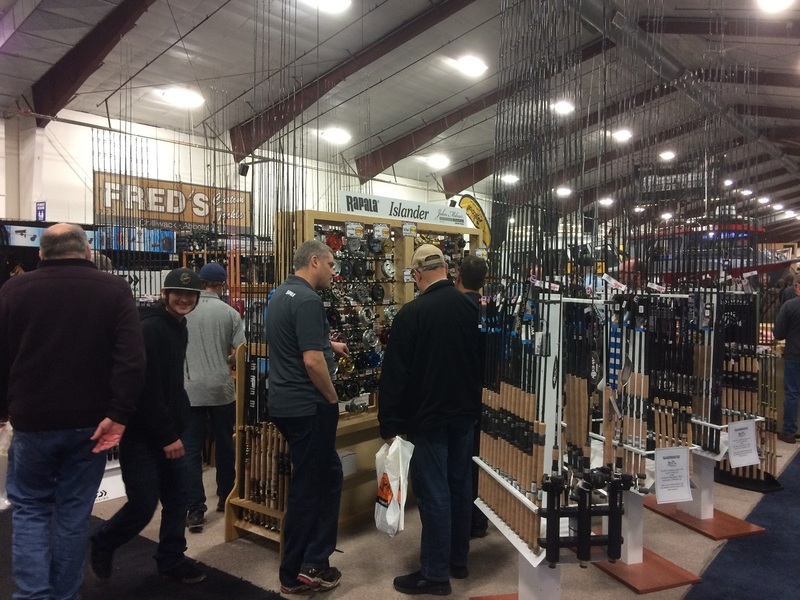 Typically, my favorite booths at this show are Fred’s, Army & Navy, Bent Rods, and the Freshwater Fishers Society of BC. There was also a few new booths (and companies) this year with some good looking swag, one in particular that stood out was the Iron Dreams booth. 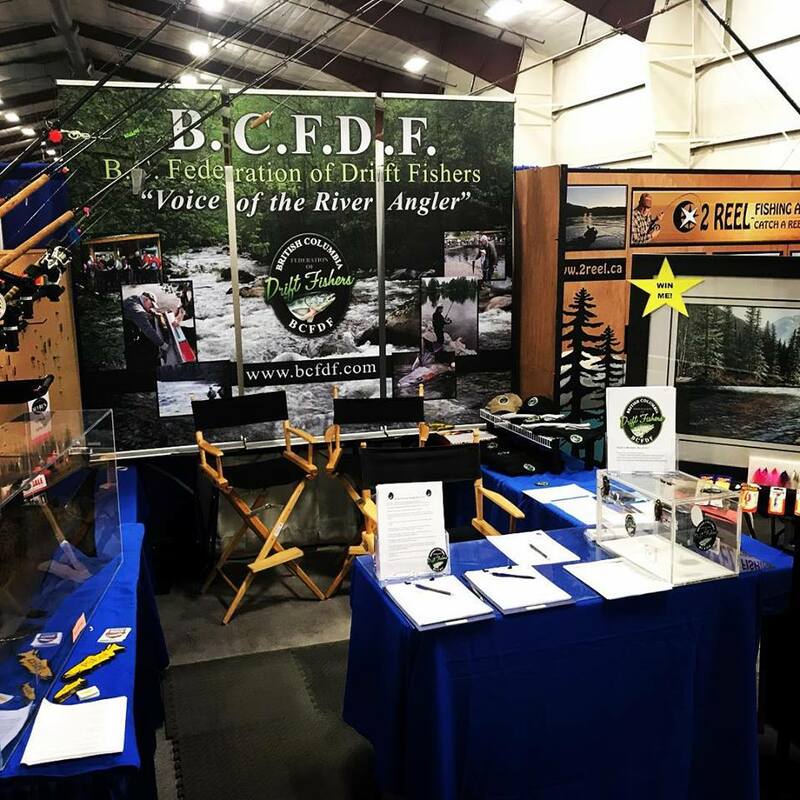 This said, my favorite booth this year was the BC Federation of Drift Fishers (BCFDF). It was great to talk with Tony Pare and learn more about all the work BCFDF is doing throughout the province of BC. I 110% support the work this organization is doing and registered as a member ($20 / year). 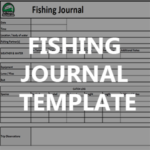 I highly recommend all BC (and NW) anglers to register or at least look into the work they’re doing for our fish and fisheries here in BC. Check out their Facebook page, or website: www.bcfdf.com. Side Note: they’re updating their site soon. 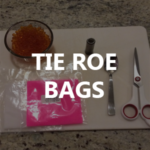 I’ve recently gotten into twitching jigs for Coho, Pink and Chum Salmon this past Fall. I’ve usually focused this technique in slower moving water or “frog water” on the rivers (and Ocean Beach fishing). It’s a great fishing approach as the take is quite the adrenaline rush! 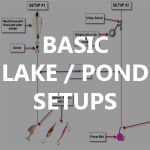 Without getting too specific it’s essentially aggressively lifting your rod tip up and then letting it down while retrieving your line. The fish most often bite when the jig is on the drop. 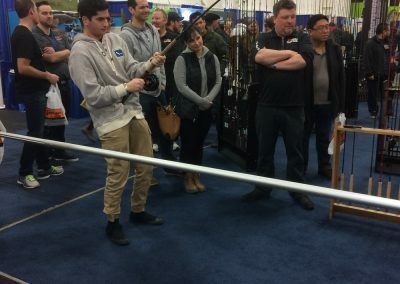 Anyway, as I’m fairly new to this technique so was interested to listen Rod Toth from Bent Rods Guiding & Fishing give a presentation on the Mercury Stage on how he targets Salmon, Steelhead & Bull Trout by twitching jigs. 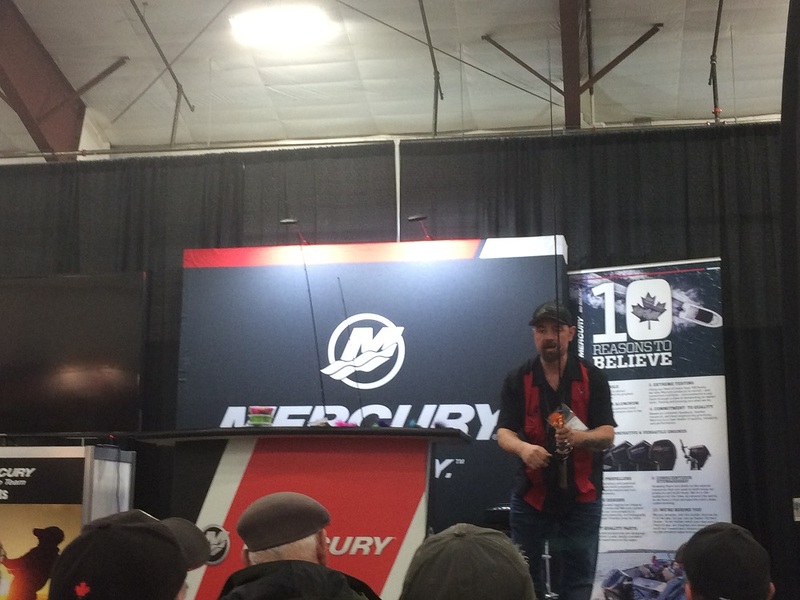 Rod demonstrated his twitching action from the stage with a few different rod/reel setups. The most common Salmon twitching setup is a 7 or 8 foot spinning rod with medium to medium-heavy weight but fast action tip. He paired his rod with a 3000 spinning reel with braid (20-30 lb). When fishing faster water he usually ties the mainline braid directly to the jig as the fish hits it out of reaction and is not worried about seeing the line. In slower water, you’d want to have some sort of mono or fluorocarbon leader line to better hide the line. The second twitching setup was a 9 foot casting rod with a small baitcasting reel. 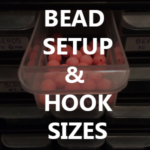 He uses this setup for Steelhead and again with the braid mainline (30 lbs) and a 4 foot monofilament leader. 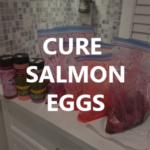 As Steelhead are known for their hard fighting runs and jumps the monofilament provides the necessary stretch in the setup, and you should avoid tying braid to the jig or fluorcarbon, which both have little to no stretch. 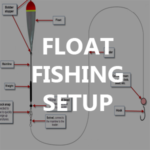 Anyway, I haven’t seen many guys use a casting rod for twitching jigs, so found this setup the most interesting and I may give it a go next time I head out Steelheading! Rods, Rods and more Rods! Video Game with an actual mooching rod & reel fighting a fish. 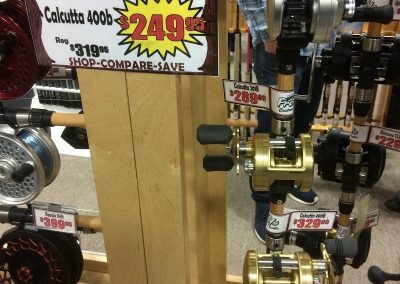 Pretty good deal on this Shimano Calcutta reel! 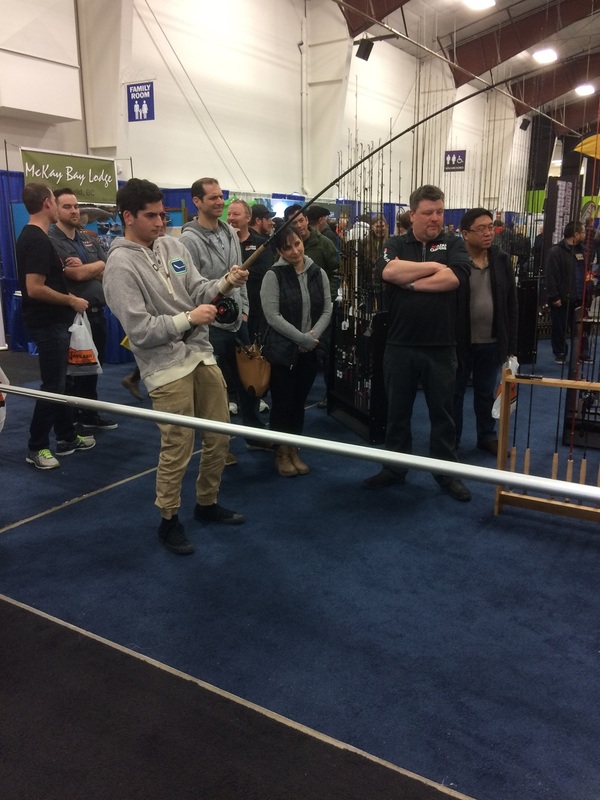 If you’re an outdoor enthusiast by any stretch the BC Sportsmen’s Show is a lot of fun. 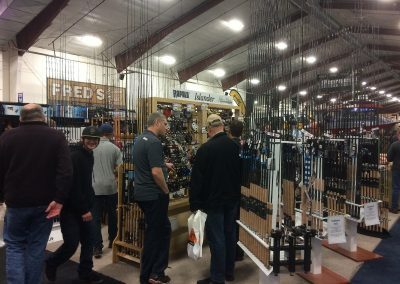 It’s packed with booths showing off the latest products and services for Fishing, Hunting, Boating and many other areas. 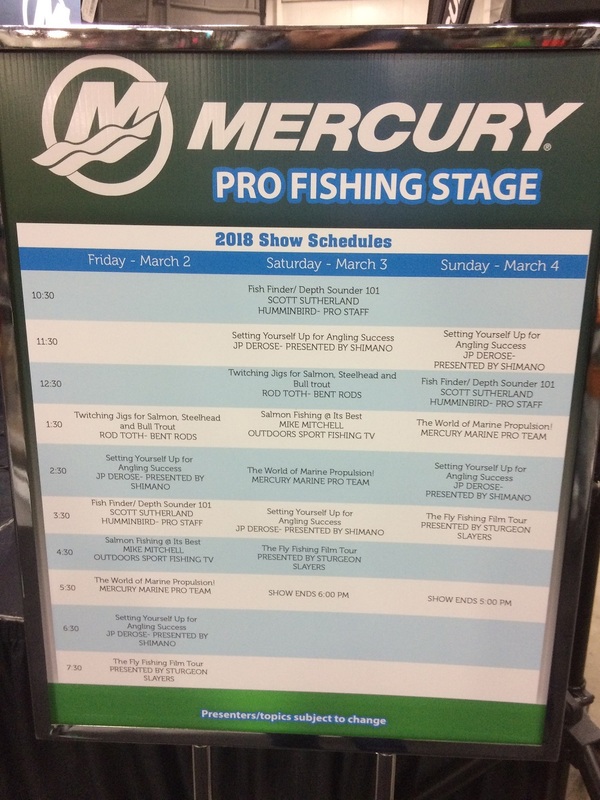 The 3-day show brings in a number of different fishing and hunting celebrities and experts and I’ve found that most of these people have been really social and open. So come with questions and ensure you learn something new in whatever your passion is! That’s it for this years show, I’ll certainly plan to be back for next year with my son Asher and my 2nd son (will be hist first time). I’m already looking forward to seeing their reactions to next year’s gear and people.